This year, it was definitely Thompson’s turn to win the All-Star Three Point contest. 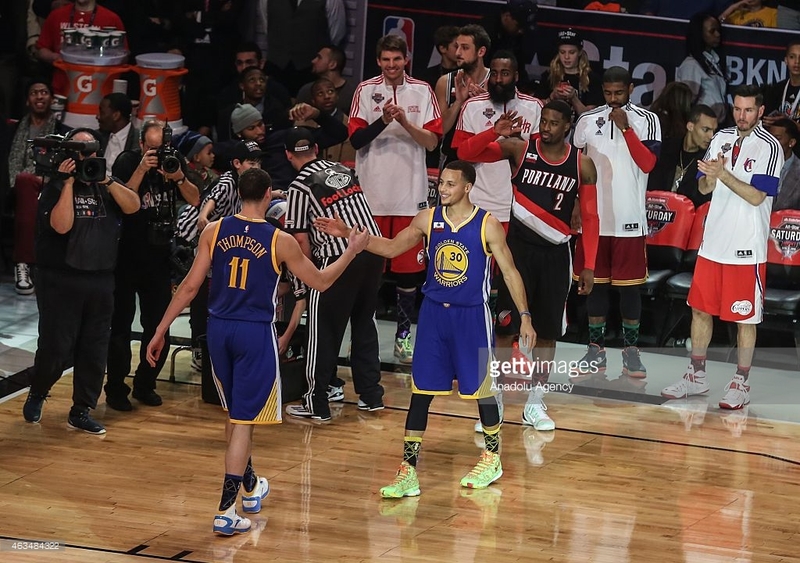 However, a year ago in New York, it was the other Splash Brother that was victorious during the very same event. Laced up in the Under Armour Curry One ‘Candy Reign’, Steph Curry beat finalists Klay Thompson and Kyrie Irving with 13 straight buckets. He got into his rhythm at the top of the key in the second round, missing the first from the center rack but making the next 13 for finish with a score of 27 — that’s 20 of 25 attempts. The 2014 defending champ, Marco Belinelli, didn’t even make it out of the first round with 18 points. 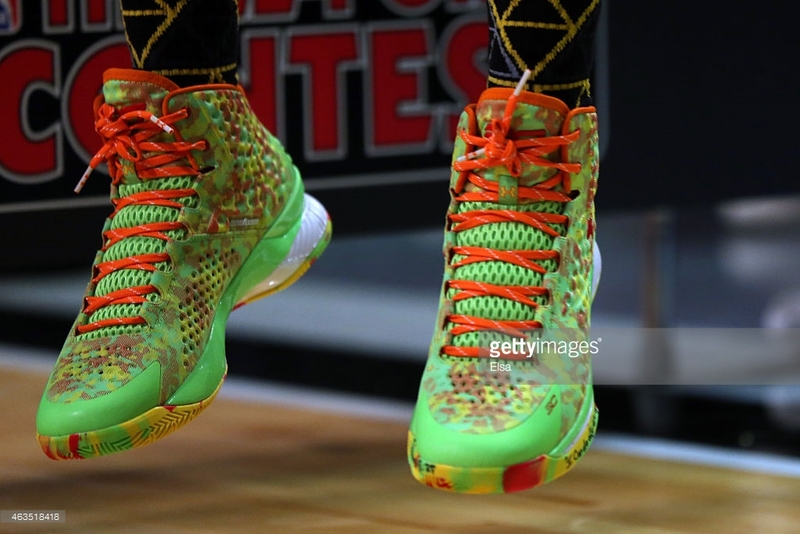 A detailed view of the sneakers of Stephen Curry #30 of the Golden State Warriors and of the Western Conference during the Foot Locker 2015 Three-Point Contest as part of the 2015 NBA Allstar Weekend at Barclays Center on February 14, 2015 in the Brooklyn borough of New York City. 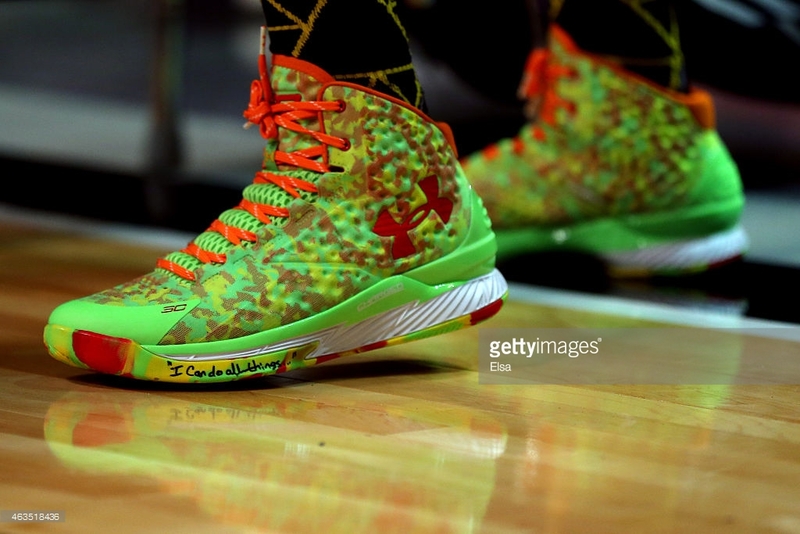 A detailed view of the sneakers of Stephen Curry #30 of the Golden State Warriors and of the Western Conference during the 2015 Three Point Contest as part of the 2015 NBA Allstar Weekend at Barclays Center on February 14, 2015 in the Brooklyn borough of New York City. 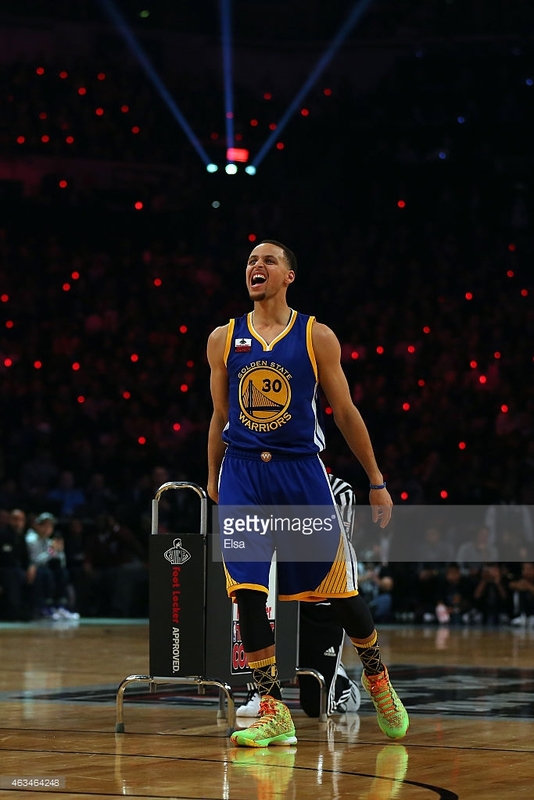 Stephen Curry #30 of the Golden State Warriors and of the Western Conference reacts during the 2015 Three-Point Contest as part of the 2015 NBA Allstar Weekend at Barclays Center on February 14, 2015 in the Brooklyn borough of New York City. 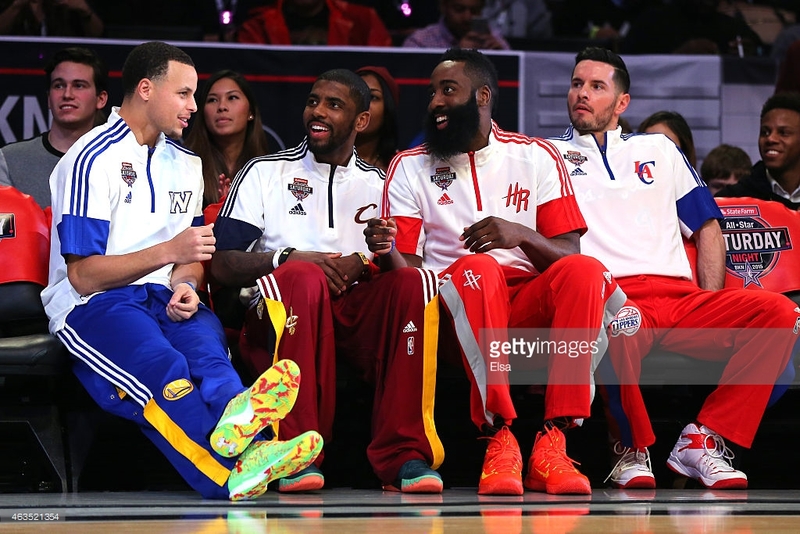 Stephen Curry #30 of the Golden State Warriors and of the Western Conference talks with Kyrie Irving #2 of the Cleveland Cavaliers and the Eastern Conference, James Harden #13 of the Houston Rockets and of the Western Conference and J.J. Redick #4 of the Los Angeles Clippers during the Foot Locker Three-Point Contest as part of the 2015 NBA Allstar Weekend at Barclays Center on February 14, 2015 in the Brooklyn borough of New York City.